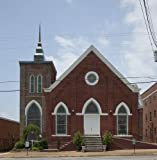 I took this series of photos of Lowndes County as part of a graduate interdisciplinary course that studied various aspects of the Black Belt region that runs through south central Alabama. One of our speaker was William Christenberry, a native Alabamian and noted artist now working in Washington, DC, originally from Hale County, one of the poorest counties in the state. He is, in part, noted for his austerely beautiful photos and structural interpretive models of rural structures in the western Black Belt, primarily Hale County. One was of a plain church named Sprott that was as beautiful as a cathedral. 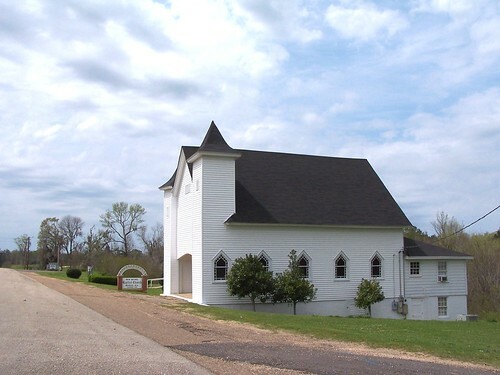 This church above is one Christenberry would appreciate. The remarkable thing about this austere church is that there is almost no camera parallax in the photo. The towers really do curve inward. Early Music Michigan will celebrate the music of that period with its concert “Beloved that Pilgrimage: Music of the Spanish Golden Age” featuring the music of Cristobal de Morales, Alonso Lobo and Orlando de Lassus at 8 p.m. Saturday at St. Luke’s Episcopal Church. Here is the 2009 All Saints Processional at the Episcopal Church of the Nativity in Dothan, Alabama, in communion with all the saints and all those who died in the hope of resurrection, particularly Pat Elliott, Madeline Lewis, John and Margaret McKinley, Britt Dowling, Jesse Pribbenow, George Ghode, Gary Jones, October Davis, and Jacob Lackey; and sung into being by the great Nativity Choir under the direction of Debbie Deas at the organ with Marcus Hart on timpani and Erman Turkili on violin.